We are increasingly relying on our mobile gadgets to manage our lives, whether it is in business, the media, social networks and, of course, healthcare. The introduction of mobile applications to the medical industry has radically changed users’ views about how to monitor medical conditions, diet and nutrition quickly and effectively. In addition to simple calorie calculators and heart monitors, applications can now check medical records that doctors make in hospitals. In the foreseeable future, healthcare applications will continue to take a more active role in managing the medical responsibilities of attending physicians. You may assume that healthcare applications are developed for patients only, but they are also actively used by physicians. Using mobile applications helps physicians monitor several aspects of their patient’s health. Some applications even allow doctors to directly conduct examinations of the patient via a smartphone. Medical apps help diagnose various conditions, make all the necessary measurements and receive test results much faster than some traditional tools. We may, therefore assume, that these devices will play a significant role in the next step for the medical industry. The importance and necessity of these apps is hard to overestimate. Healthcare applications take a sound understanding of health responsibilities to a new level. One might even say, thanks to mobile applications, a revolution in the field of healthcare will happen a lot sooner than we ever imagined. We both defined that medical applications are something more than just apps for fitness and a healthy lifestyle. Now it’s time to determine what lies ahead for medical mobile app development. Before we answer this question, let’s define the current trends of mobile app development in healthcare and the impact these applications, in general, have on the mediсal industry. We all know that the main challenge for mobile app developers is to define the end user’s needs. Despite the fact that the medical industry is a complex area, the same rules, which usually define the concept of usability, apply here. There are several directions in the development of medical mobile apps, but the main ones are patient-oriented apps and specialist-oriented apps. Patient-oriented applications work directly with patients. They may schedule medication or a remind uses to visit a doctor, for example. This category also includes fitness, diet and nutrition applications. These are probably the most popular applications among common users. Other applications, such as patient portal apps and facility information apps, allow users to receive any information they need about a clinic and its services. Apps also give access to personal medical records via the internet. Developers of such apps are constantly looking for new ways to improve the applications including the ability to collect and analyze information about a patient’s health from several healthcare devices. The development of specialist-oriented apps is quite focused. These apps are intended to only be used by doctors and healthcare specialists. With the help of specialist-oriented applications, professionals can check patient’s test results and check many other aspects of their health. A relatively new trend in this direction is the observation of the patient’s health in remote mode. Through the app, a doctor can monitor vital signs and symptoms a patient may have. Another unique trend is using an application and a special smartphone attachment to conduct an ECG right from the smartphone and send the results to the attending physician. The doctor can then share this information instantly with his colleagues. For remote consultation, a physician can also send patient data through a secured connection to another healthcare specialist. All these benefits significantly simplify communication within the healthcare industry, allowing decisions to be made much quicker. This is particularly important when a patient’s life depends on quick results. While analyzing all the examples above, you can see which tasks are most relevant for the medical industry now and what the development direction for future healthcare applications will be. Users have become more aware of their health with these applications. Also, patients are becoming more likely to meet with their doctor. They start to think of diagnosis at the first sign of symptom, rather than waiting until the condition progresses and symptoms become more severe. An excellent example is an application that uses complex algorithms and a smartphone’s camera to analyze body moles to determine if it might be malignant. If it is suspicious, a patients should seek medical attention immediately. Another great feature is healthcare apps that can now give patients online access to their test results. They can see any changes to the database and their personal account, reducing the risk of medical fraud. As we see in this case, mobile application developers are taking care of patient safety as well. Another important feature of medical applications is that they break down the wall between doctors and patients. Let’s be honest, very few people like to visit the doctor. With the advent of mobile applications, communication between doctors and patients has become much easier and more convenient. Now, anyone can get a professional medical consultation right from their device. This is much more convenient, isn’t it? This year promises even more breakthroughs the healthcare app industry. Developers will use modern medical standards to develop new and more accurate algorithms for healthcare applications. After all, data accuracy in medical applications is fundamental to their usefulness. According to experts in the industry, the medical mobile market will grow to $ 26 billion in 2017. This shows that medical applications are taking a permanent place in our lives. Moreover, individual users state that the use of medical applications has a positive impact on their health. Of course, it’s too early to say that it is a widespread phenomenon yet, but it will happen if users and healthcare professionals are aware and take advantage of all the opportunities that medical applications can provide for monitoring our health. It should be noted that all features of healthcare apps are developed simultaneously with the development of the medical app market. We can assume that this trend will continue – developers will introduce more and more functions. You might say that is more than a hypothesis; it’s a fact. Today, patients and physicians are using smartphones and it would be absurd to not begin using these devices for communication in the healthcare industry. These processes will break down any of the current limitations of the medical industry you can imagine. It’s important to understand that healthcare apps aren’t just planners or reminders. These are assistants, who are responsible for analyzing our health and informing us of any changes if something goes wrong. We are sure that you agree that this is an important aspect, which continues to grow as the IT technologies grow. To develop healthcare applications in our company, we draw from all of the newest technologies and best practices of the medical industry and the latest medical mobile app development trends. In the final analysis, this allows us to produce projects that maximize the user experience. 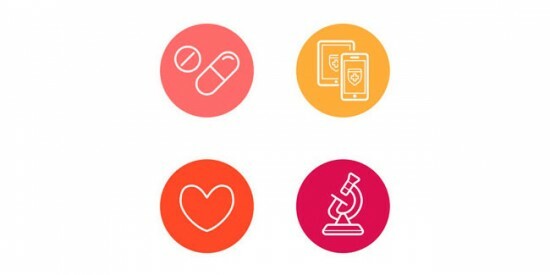 If your company would like to develop a healthcare app, contact us and we will be develop a unique healthcare product that will meet all of your requirements. After all, health is not just a word. There is no room more mistakes here. Archer Software provides healthcare software development services and has a lot of experience developing applications. Here in Archer software we are happy to contribute to our clients mission and help healthcare industry to benefit from novel and proven information technologies. We do always keep abreast of the latest trends in health care software development and provide advanced solutions to our clients. Our experts are prepared to cooperate in your wearable app development for healthcare project implementation disregarding current project state or your product lifecycle be it business analysis phase, UI design, architecture development, building hardware interfaces, integration with third party systems, existing software upgrades, testing or NetOps support. Today mobile apps are everywhere. And I am sure that in future these will be playing a crucial role in medical field. Many web design company jaipur are making their mobile app development branches strong to make a medical apps.